The pedestrian pathway to Centennial Walkway is effective as of June 20, 2011. Vehicle/traffic closures after June 1, 2011. A portion of Aztec Circle Dr. will be closed. The 5-star parking lot south of Aztec Center will be closed. A portion of parking lot ‘W’ (the lower level parking lot just north of PS 4) will be closed. The top level of parking structure 1 will be closed (click on image to enlarge). The route that is in red may have some problems throughout the year. During the beginning of each school year the Trolley Authority patrols the elevators for all person(s) that may be riding the trolley and will not allow them to exit or enter the elevators without a trolley pass.Would it be possible to leave a walking path just west of the construction area to avoid being hassled by the Trolley Authority. That pathway will change. The first part of construction requires a much larger construction site footprint because they will be relocating utilities. Once that first part is done, the fence line will move back and allow foot traffic just west of the construction site. I’m concerned that you’re closing two parking lots. 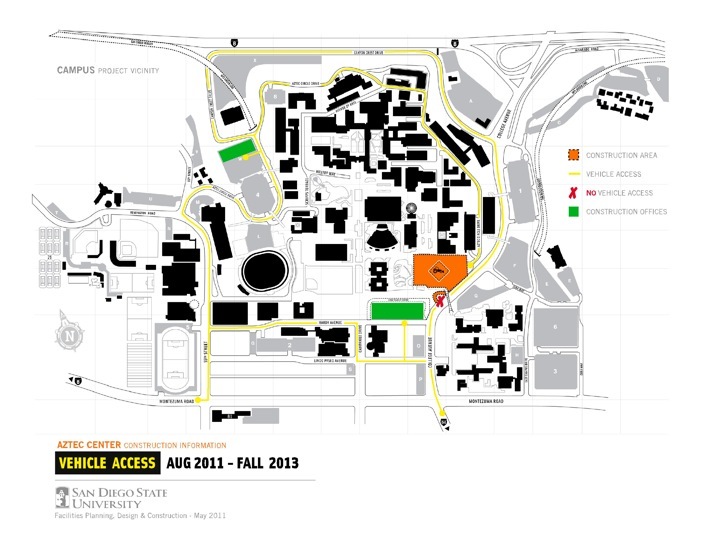 With the uptick in students this past semester, parking has become very difficult to find. Hi, Laura. Thanks for letting us know your concern. There are two pieces of information we want you to know: 1) The only lot that is completely closing is Parking Lot B, which is the Five-Star visitor pay lot (not a SDSU permit lot) across from the bus terminal. Nearby alternatives are the other pay lots along College Avenue. 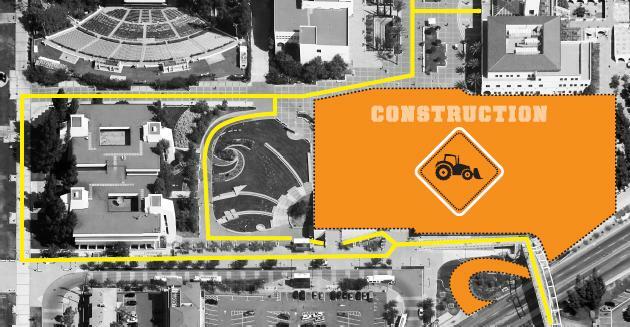 2) Only a portion of Parking Lot W (SDSU permit lot) will be closed. If the lot is full, however, nearby alternatives are Parking Structure 4 and Parking Lot X (both SDSU permit lots). In preparing for this project, we reviewed several alternatives for our staging areas and these two locations were the least disruptive to the campus. We understand you may have to walk a little farther to get to your destination on campus, but we hope you understand this inconvenience is only temporary and that it will help bring us to the new Aztec Center.